Sandcast Sterling Silver Bracelet featuring Genuine Royston Turquoise. The Royston Turquoise Mine was originally known as the Royal Blue Mine. It produces Turquoise that has a mixture of blues and greens in the same formation. The Royston Turquoise Mine is located in Nye County, Nevada. 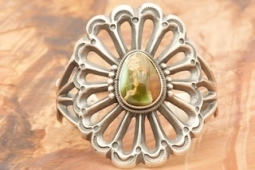 Created by Navajo Master Silversmith Harrison Bitsue. Signed by the artist. Bracelet is 2 3/8" wide.